Behavioral Targeting and Online Privacy is taking an interesting turn. Yesterday I wrote about Privacy groups proposal to create “Do-Not-Track” for online behavioral targeting just like “Do-Not-Call” list to stop telemarketers from contacting the people on the list. To counter these groups, AOL took a proactive step by announcing the launch of Privacy education program for Behaviorally Targeted Advertising. "I believe that if consumers are provided proper education then they can in fact benefit from Behavioral Targeting. It will be a win-win situation for all the parties involved. Proper education and disclosures by advertisers, publishers and networks will ease the concerns regarding Behavioral Targeting. Consumers have the right to opt out of Behavioral Targeting but what is lacking is proper education on how to do so." The expanded use of the TACODA opt-out technology will help better preserve consumer choices. Today, users who opt-out of behavioral targeting by using an opt-out cookie risk having their preference lost if they later delete their cookies. TACODA leverages a Web cache technique to preserve a consumers' opt-out choice even if they delete their browser cookies, something other opt-out systems cannot currently do. AOL is also exploring opportunities to license this technology on a royalty-free basis for use exclusively in consumer privacy protection programs. AOL says it is setting up a new Web site that will link consumers directly to opt-out lists run by the largest advertising networks. The site’s technology will ensure that people’s preferences are not erased later. There is a silver lining for marketers, however: the AOL site will try to persuade people that they should choose to share some personal data in order to get pitches for products they might like. Most Web sites, including AOL, already collect data about users to send them specific ads — but AOL is choosing to become more open about the practice and will run advertisements about it in coming months. I think this is a very smart move by AOL/Tacoda, if it can convince consumers about the benefit of Behavioral Targeting then why not take one step further and have these consumers provide more information about themselves. An article in AdAge reports that Privacy Groups Propose Do-Not-Track List. "Demands of these groups would Hinder Marketers' Behavioral-Targeting Practices Online. ...Typically, advertisers and online media sellers use web cookies to track and maintain information about online consumers. A cookie might be used to figure out what's in a user's shopping cart on a retail website or to record a user's login for a particular site so that user doesn't have to re-enter a login name and password every time they revisit the site. Cookies can also be used to track surfing behavior and offer up ads based on a user's surfing history. Thanks to such behavioral-targeting technology, a user looking at a specific type of auto on a car-review site, for example, could be targeted with an ad for that particular make and model even when they move onto a general-interest site. Behavioral targeting tends to create more valuable inventory and be more effective, according to many advertisers and publishers familiar with the technology. …However, consumer-privacy advocates charge that collecting such information in order to target ads creates "a privacy imbalance that has deprived Americans of the right to control their personal information." If consumer don’t like the irrelevant ads but still prefer free ad-supported content to paid ad-free content, how are these groups going to provide that? How are they going to create Do Not Target list without (Personally Identifiable Information) PII information? One solution is used by NAI, that is to drop a cookie to indicate that user should not be tracked. But if a user deletes NAI cookie then the user is back in “Do-Track” list since most of the targeting solutions are “Opt-Out’ systems (user is opted-in by default). Is anonymous tracking really a privacy concern? Do consumers really care about Privacy? Or is this mostly a concern of these groups? Anonymous cookie tracking is still better than what these users provide online to the social networking sites. Look at facebook.com, myspace.com where users voluntarily provide information everyday about their whereabouts, likes, dislikes, friends etc. In my previous posts concerning privacy I proposed that Behavioral Targeting should be “Opt-In” instead of “Opt-out”, let the users make a call if they would like to be tracked to see more relevant ads. "I believe that if consumers are provided proper education (I will write about consumer benefits in one of my future posts) than they can in fact benefit from Behavioral Targeting. It will be a win-win situation for all the parties involved. Proper education and disclosures by advertisers, publishers and networks will ease the concerns regarding Behavioral Targeting. Consumers have the right to opt out of Behavioral Targeting but what is lacking is proper education on how to do so. The networks currently opt-in users by default; however, in my opinion the proper process should be opt-out by default and opt-in if user chooses to opt-in, just like we do for emails and newsletters. This process will move the burden from users to the advertisers, publishers and networks. In short run this could result in a lower reach for BT providers. But if the benefits to consumers are properly stated then most of the consumers will be willing to participate. If you (network or advertiser) tell a consumer that he/she does not need to go looking for deals or offers of products/services that he/she is in the market for, these deals/offers will be provided to him/her based on her online behavior no matter where in the network she is in, I think consumer will love it. If a consumer knows the process and she knows that she is willingly participating in the BT, the click-through rate on the ads will be higher too. Why force users into Behavioral Targeting and raise privacy concerns when you can offer them what they want (when they want) and make them your raving fans." Is Google’s Behavioral Targeting Flawed? I can see how Google’s BT can be concerning for some advertisers and consumers. Google Behavioral Targeting (BT) by no means is an advanced one. They just use the current search words with the last search words in the same session to figure out user’s intent and then serve the relevant sponsored links. However, it raises two questions in my mind. How many times a consumer jumps from one city specific search to another? If I live in Seattle, most of my searches are in Seattle area. I hardly switch from “Seattle Care Dealer” searches to “Los Angeles (or any other city) lawn care” search. Does anybody have any study that shows how people switch cities in their searches? If I do a search for a “Seattle car dealer” and then a search for a “lawn care”, am I not the same person who was in interested in “Car dealers”? Then don’t you think showing a car dealer ad while searching for “lawn care” is relevant to me? If you agree then I don’t see where is the issue with Google’s Behavioral Targeting? The whole promise of Behavioral Targeting is to show the write ad/content/offer/product to the user based on their behavior instead of the context (in this case showing a “car dealer” ad even though user is searching “lawn care”). Do consumers (searchers) consider the sponsored links as advertisements or a part of the search result? If they consider these as a part of search results, then yes showing the unrelated results definitely will add to the frustrations consumers’ experience with Search. But if consumers consider them as advertisements more than as a part of search results then, IMHO, it is ok to show out of context ads as long as they are relevant to the consumers. Several studies have shown that Click Through Rate (CTR) on the organic results are far more than CTR on Paid (Sponsored) results indicating that users considers these paid listings more of an advertisements than search results. What do you think? Would you, as an advertiser, want to see your sponsored links show up out of context (content) but relevant to the user? As a consumer, do you consider sponsored links as advertisements or as a part of the search results? Behavioral Targeting (BT), as I predicted earlier this year, has become very common term among marketers. Look at any online marketing events and you will see more than one session on Behavioral Targeting. This was also evident at eMetrics in Washington DC, where a full track was devoted to Optimization and Behavioral Targeting and several other speakers, not in this track, also talked included Behavioral Targeting in their presentations. At the end, I showed how on-site Behavioral Targeting can be accomplished without using any third party Behavioral Targeting tools. You can use any Web Analytics tool including Google Analytics, persistent cookies and some coding to get Behavioral Targeting going on your site. This is a great way to try on-site Behavioral Targeting before spending money on third party tools. 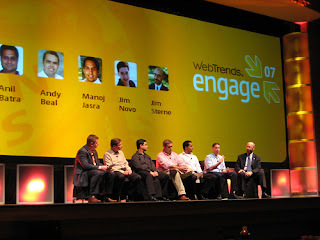 Earlier this week, I attended WebTrends’ Exchange conference in Las Vegas. Here are some highlights of the conference. Picture courtesy June Dershewitz of Semphonic. As the name suggest the theme of the conference was visitor engagement. I had a privilege to be on a panel with Gary Angel, Andy Beal, Manoj Jasra, Jim Novo and Jim Sterne. All of us, except Andy Beal, came from Web Analytics background and were in agreement that Engagement was not an excuse, it is a metrics. Andy Beal brought some interesting points about how we should look at engagement not from just web point of view (which was mostly the focus of this conference) but should take other channel e.g. offline into consideration when measuring customer engagement. “Web Analytics won’t be standing alone - Marketers will want 360 view of the customers.”. Guess what? 360 view of customer was another of the subject that was discussed in this conference. Another validation of my predictions. On Tuesday evening, WebTrends threw a great party at the Palms hotel. The view of Vegas strip from the club was excellent, great choice of venue. It was interesting to see these web analytics folks “engaged” in dancing, free drinks and with each other. I was very impressed with Visitor Intelligence and WebTrends Score. I have to say Visitor Intelligence is a great tools for doing advanced segmentation. A very easy to use interface, just drag and drop dimensions and measures and build your segments. It also has the ability to exports the cookie ids so you can take action on your segments, yes I am talking about targeting (behavioral targeting in particular). If defined properly (that’s the key) engagement metrics can be good measure of past and predictor of future. Here is tool which can help you in defining engagement. Also, score provides a way to segment your users and then do on-site Behavioral Targeting. WebTrends is on the right track with their new products and you will see them giving Omniture run for their money. Omniture get ready for some stiff competition. The more I think the more convinced I get that Webtrends is making the right moves. Howvere WebTrends has to make some more moves to get these products adopted by the market. I have my opinions on how Webtrends can make these products a success, and I already talked to them about it. Thank you for listening, I hope you will also act on what I said. If you are from Webtrends and want to listen to those again I would love to talk with you(Note: I will be at eMetrics next week). I have talked to several people about my concerns and they all agreed, so this is not just me. My view of the future and how cookie deletion won’t matter, yes, you will have to wait for it. I have discussed my views with two fellow bloggers and they have promised not to reveal it. Then I am off to India for a week. Continuing my series of interviews with Web Analyst, here is an interview with Manoj Jasra. How long have you been working in web analytics field? Tell me about your work and education prior to starting in Web Analytics? How did you choose a career in Web Analytics? Enquiro had a need for a person dedicated to analytics so that we could offer our clients more value in our service offerings. Personally I don’t think I ever permanently switched to analytics, rather expanded my search marketing skill set with that knowledge. How did you find your job at Enquiro? How long did it take? I think it was a little bit of luck, fate, skills/education and timing. A friend of mine was actually applying to work at Enquiro and I was just coming along for the ride, however I ended up submitting my resume and beat him out for the position. At that time it was a fairly quick interview process with only 1 interview. What are you responsibilities? Describe your typical work day. I wear a couple of hats at Enquiro. As the Director of Technology it’s my job to establish relationships with other vendors to help find the best of breed tools to integrate into our services. I also handle many strategic tasks related to Web Analytics ranging from analysis to implementation. Originally my background was in Software development therefore I am always providing consultation on technical SEO tasks as well. What, if any, education or work experience helped you in making this role? I think the best way to understand this role is to get your hands dirty with data analysis and implementation manuals. I started by testing on Enquiro’s own site using Omniture’s SiteCatalyst. There are many good courses and seminars offered by the Vendors and the Web Analytics Association and I am sure if took more of those they would have helped me progress quicker. I have Eric Peterson’s Big Book of KPIs and Web Analytics Demystified, Actionable Web Analytics (Jason Burby/Shane Atchison) and would love to read Avinash’s Web Analytics: An Hour a Day. I am currently reading Chris Anderson’s, The Long Tail. Which book(s) helped in you in starting in your job? Web Analytics Demystified was a good place to start. What were the major challenges you faced or are facing in this industry? I write Web Analytics World, http://manojjasra.blogspot.com/. 50% is dedicated to Web Analytics and 50% is dedicated to SEM/Technology/SEO/SMO. I provide insight on the latest news in the industry; I conduct interviews/podcasts and provide strategic recommendations for online marketing. I think 2 of the biggest skills required to be a web analyst is to be able combine technical skills along with business/marketing skills in order to understand your customer’s goals and provide value to them. Secondly you have to be passionate about what you do, if you don’t like what you’re doing you will not give 100% effort. Theoretical skills are important but will only get you so far therefore it’s important to get “hands-on” experience right away. If you like this post, you might want to subscribe to my blog feed. Click here to subscribe to Web Analysis, Behavioral Targeting and Online Advertising. If you are in web analytics field and would like to interview for my blog please contact me at batraonline at gmail.com. Engagement, is it a metric or an excuse? Avinsah Kaushik, posted a blog post stating that “Engagement is not a metrics, it is an excuse”. I beg to differ with Avinash on this one. I agree with Avinash that there is no standard way of measuring engagement. And my argument is that we don’t need a standard way to define engagement. Engagement metric is site specific and companies should have their own engagement baselines and trends. It is not a metrics that should be used to compare sites, because, as Avinash said in his post, each site is unique and hence the how each sites define engagement is going to be unique. Avinash states “One of my personal golden rules is that a metric should be instantly useful. This one is not. Say you measure engagement. It could be a % or a absolute number or a ratio or whatever (in fact it can be any or all of those at the same time). You fire off a graph or a excel spreadsheet with trends. You repeatedly get asked: What are we measuring?”. Question is when don’t we get questioned? A lot of marketers still have confusion about visits and visitors (believe me for 4 months I had to explain this multiple times to a marketing director of a major company). But that does not mean we should not use them. As an analyst our job is also to explain what measure makes sense, why they make sense and how are they calculated. You have to make sure your KPIs are not for the sake having KPIs, they are Key Performance Indicators for your Business. Same goes with Engagement as a KPI or even just another metric, you have to define it properly keeping your business goals in mind, make sure stakeholders understand what it is showing, why should they care and how it affects the business. Engagement, to me, is not just about looking at the history, like most of the KPIs do. If defined properly (that’s the key) engagement metrics can be good measure of past and predictor of future. Ultimately there is are business goals for having a website, weather those are conversions, creating a brand value, driving more offline sales or something along those lines. Engagement metrics can also show you where you should spend your money, which segments to cater to. If you correlate your engagement metrics with your goals you will be able to come up with a model for predicting the future. Engagement metrics can serve as the leading indicator telling you if you will meet, beat or miss your goals. Engagement metrics allows you to be proactive. That is the beauty of engagement metrics. So, given that, I don’t think engagement metrics is an excuse. It is actually very powerful, better than past indicators. Next week I will be in Las Vegas on 8, 9 and 10. No, I am not going to gamble (well maybe a little) but I will be there to attend WebTrends Engage 2007 conference. This is another great web analytics conference. I highly recommend this conference even if you are not a WebTrends customer, as it will allow you to see what WebTrends can do for your business. This conference will provide you an opportunity to learn from current WebTrends customers and other experts in the field. I will arrive there on 8th evening; I would love to meet with readers of this blog, so if you are going to be there email me at batraonline at gmail.com.